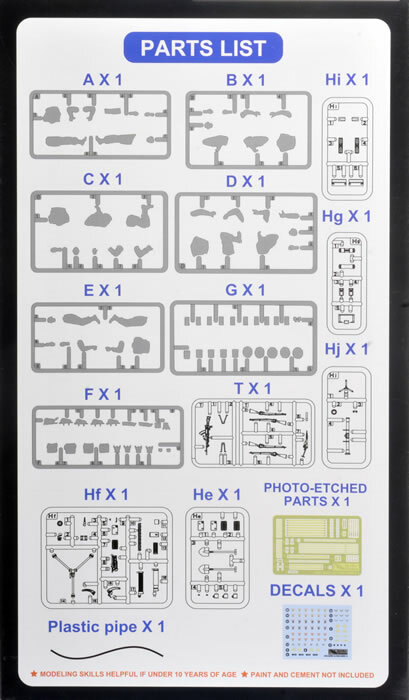 133 grey coloured parts on 13 sprues; one PE fret; one plastic tube; one decal sheet. Offers a British Vickers MG gun in action with a crew and rangefinder. 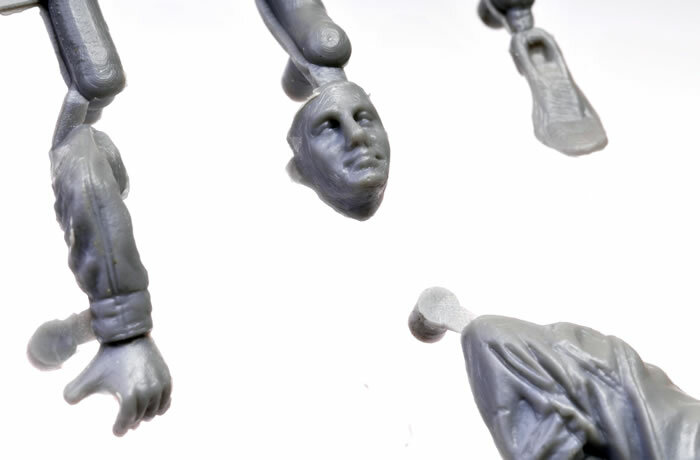 This is a fantastic and long overdue set that can be turned into a great vignette or added as part of a larger diorama. The detail is good although there was a small amount of flash present. 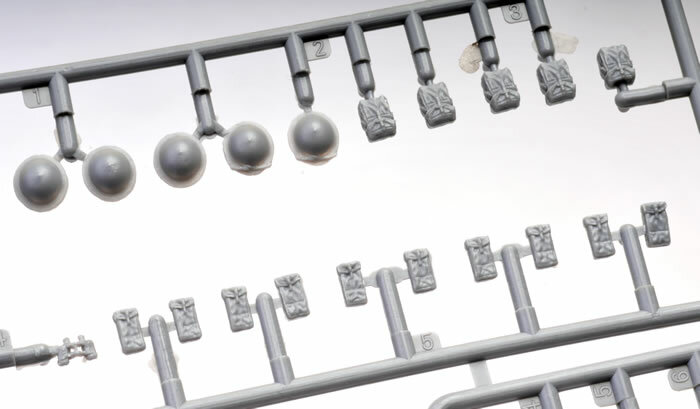 I look forward to its companion set of an MG Detachment Marching. 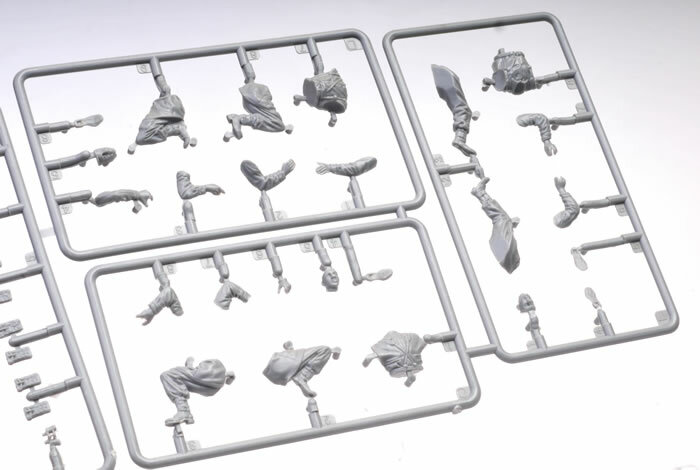 The kneeling figures will have a host of other uses for conversions. 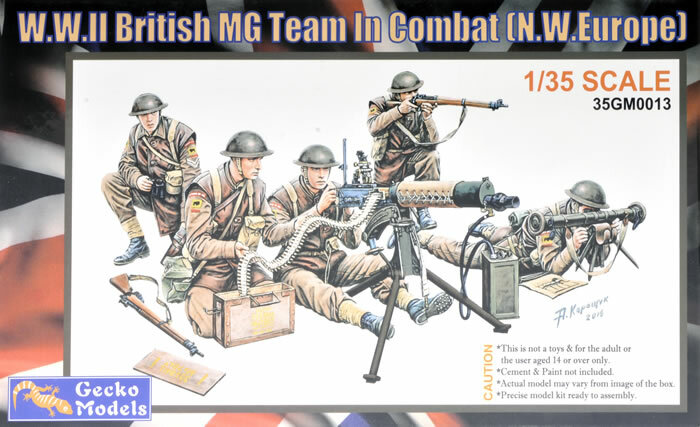 For the long suffering modeller of the British Army in WWII, the last year has seen a number of releases of mainstream British subjects hit the market from several new players in the market. 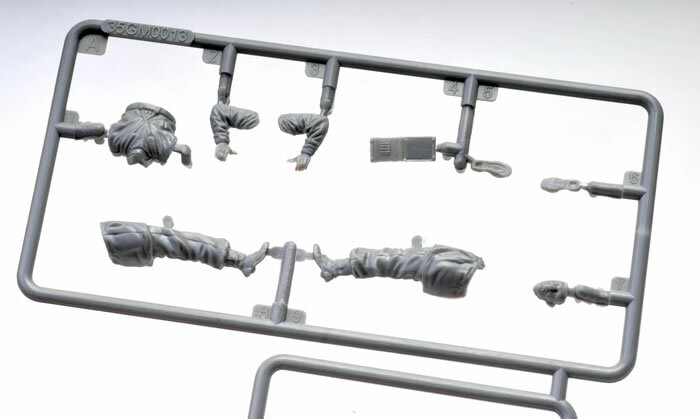 Hot on the heels of their excellent A9/10 series of Cruiser tanks comes Gecko Models’ first figure set which is a Vickers MG team in action dressed for the North West Europe campaign of 44/45. The Vickers MG was employed in Infantry Battalions and specialist machine gun BN’s attached to Divisions and allocated to formations as required. The Vickers was a WW1-era water cooled medium machine gun firing the .303 rifle bullet. It was capable of sustained fire for long periods and employed in groupings used mainly in the indirect fire mode in both defence and attack. As such, the weapon had indirect fire sights which are faithfully reproduced here along with a supporting crew of five. 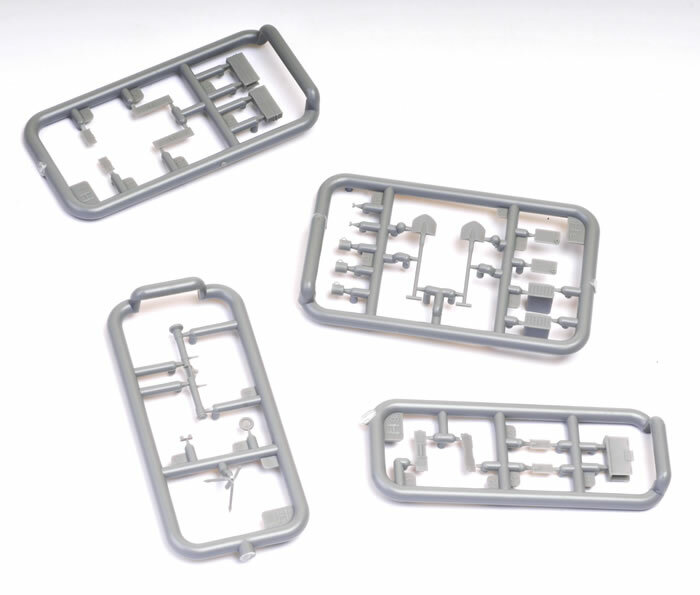 The kit comes in a familiar sized box for 1:35 scale figures but it has an inner box of sturdy cardboard with a top opening lid which will be handy to protect the delicate parts and to hold them whilst working on them. 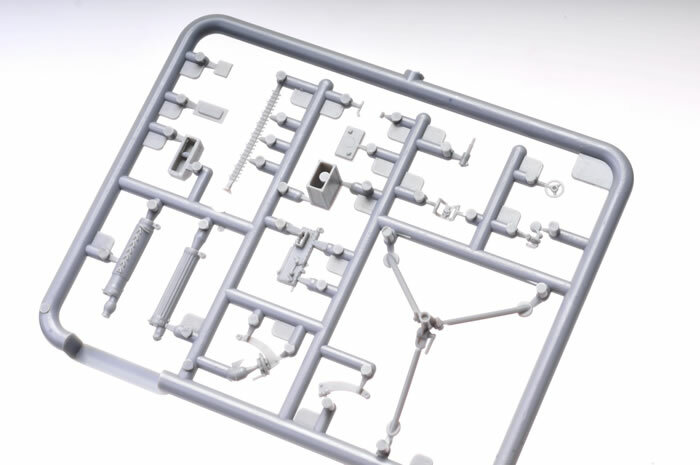 The box has a small instruction booklet in colour, which is a new one to this modeller for a figure set. 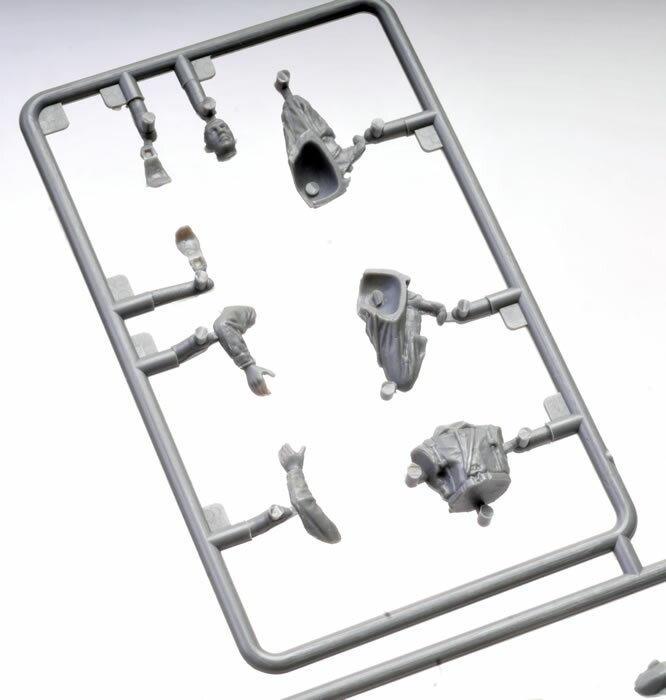 It contains 13 sprues in light grey plastic containing 133 parts with some being very miniscule but well detailed. 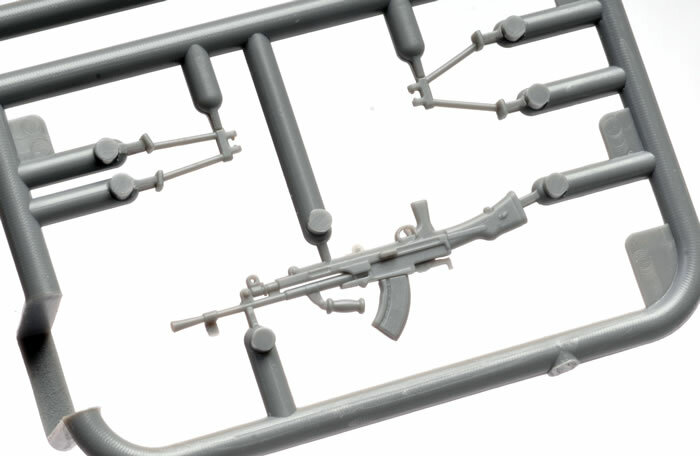 It also has a vinyl hose for the water recuperator and a good sized photo-etched fret with numerous weapon slings and detail parts for the gun and the ammo boxes, plus a large decal sheet with uniform insignia and ammunition box stencilling. The Vickers MG is the best I have seen in this scale and is made up of 17 plastic parts plus 1 photo-etched fret and 1 vinyl hose. It offers the options of the solid or corrugated water jacket. A sleeve is on the solid jacket. The gun has the direct fire sight fitted. Detail on all the weapons is exceptionally well done with a hollowed out muzzle on the Bren. Two recuperator cans and three ammo liners are included with one belt of ammunition depicting the cloth belt well. The rangefinder is on a small tripod (very delicate) and is in four pieces. 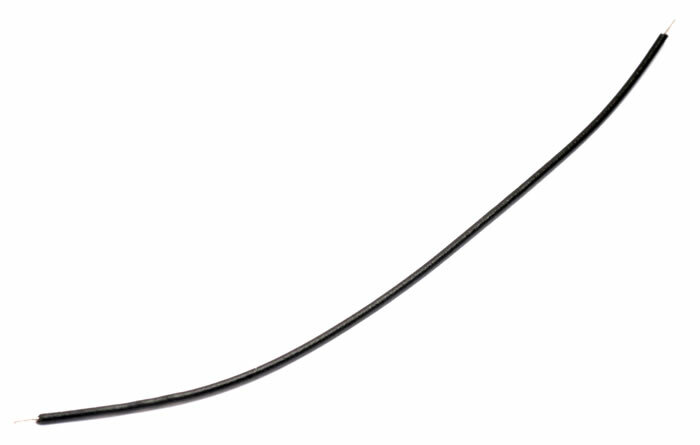 Photo-etched slings are provided for all small arms and ammunition liners etc. Additionally two shovels and three teacups are included! 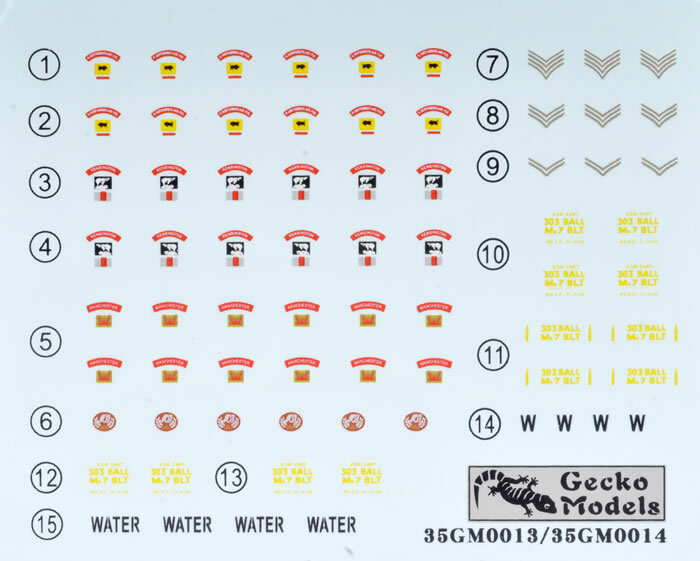 The decal sheet has markings for 3 Infantry formations that fought in North West Europe. Although no ID is given by Gecko, they are 11 Armoured Div (159 Infantry Bde), 49 Inf Bde (Polar Bears) and possibly 53rd Welsh Infantry Bde. 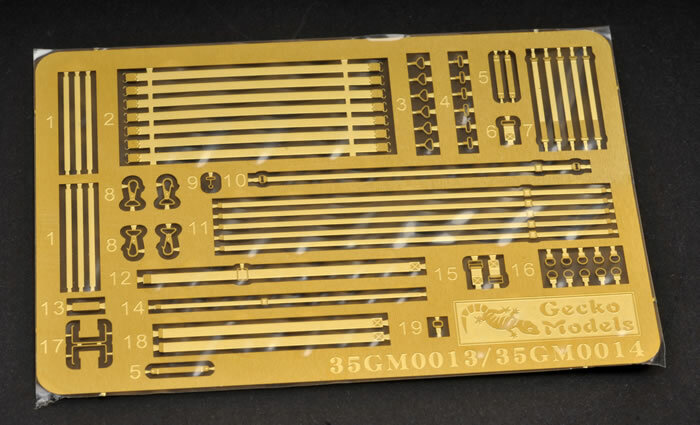 Rank patches for Lance Corporal through to Sergeant and MG Specialist Badges are supplied on the decal sheet. 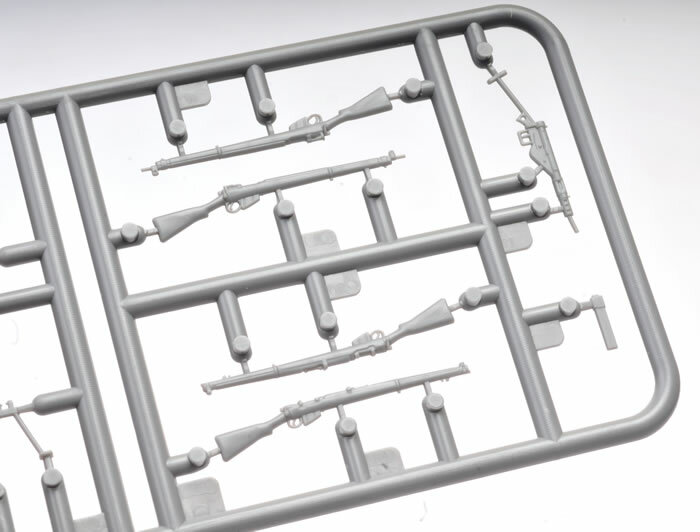 Decals for the Ammunition box stencilling and the recuperator cans is also included.